As tenants relocate their offices in this economy, they are often subletting furnished space or purchasing new furniture. 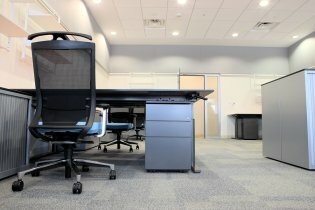 As a result, it is often asked if UMC can liquidate or dispose of the remaining office furniture or cubicles? Upon completion of the corporate & office relocation, UMC will deinstall all remaining office furniture and dispose as required leaving the premises in a “Broom Swept” condition which is normally a stipulation in a lease. If the client just abandons the furnishings, the building owners will charge a premium plus penalties for performing the cleanout. UMC can be the single source to relocate and liquidate for a hassle free move. As companies are planning a move, there may also be a plan for liquidating all remaining furniture, cubicles and file cabinets to be in compliance with the lease agreement of leaving the origin premises “Broom Clean”. Recently, UMC Moving was relocating Nippon Benefit Life from 521 Fifth Avenue to 655 Third Avenue and the client requested a Quote from UMC to dispose of all remaining office effects once the physical relocation was completed. Upon client review, UMC offered the best alternative for the liquidation. UMC began on a Friday Evening by using Garbage Compactor Trucks to dispose of all the wooden case goods furniture such as desks and credenzas as well as 75 cubicles. On Saturday, UMC loaded the numerous file cabinets and refuse left behind. UMC personnel vacuumed the space and Nippon was able to deliver the keys to the landlord and meet its obligations. The disposal of furnishings is a common request from clients who are planning an office relocation. Charities have become more selective in what they will accept and often don’t want to pay the dismantling/moving costs associated with the donated goods.